Today, we are going to visit London and explore a gorgeous family home that was refurbished by design professionals The Market Design & Build. Not only will we get a chance to really explore a modern and refreshing design, but we will pick up some tips and tricks when it comes to our own homes. What is most striking about this project is how the designers have managed to achieve a perfect balance between functional and stylish, ensuring that this home is timeless yet trendy and comfortable yet classic. 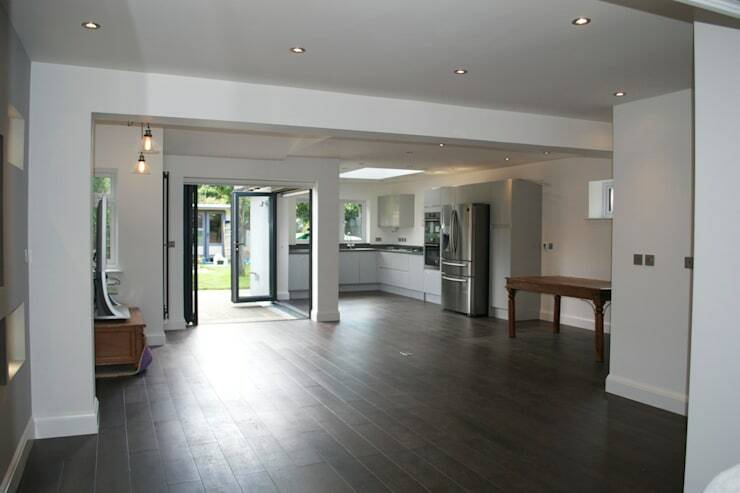 As we look through the images of this home, have a look at how the designers have managed to capitalise on natural light as well as an open plan design. You mean learn a thing or two! In this image, we can see how the home has been refurbished, working in harmony with the original design and structure. 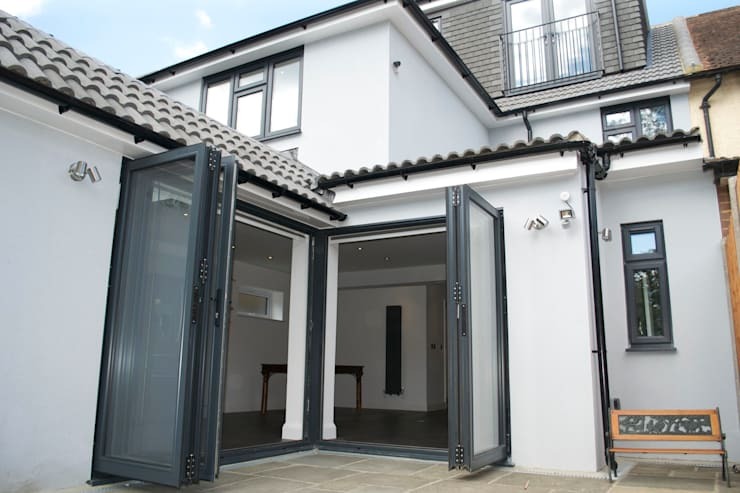 The designers have gone for a pale facade, which is finished with a gorgeous grey roof and black window and door frames. The interior space opens up onto a gorgeous terrace, creating a much bigger and more expansive living area. The large glass doors, which fold into one another, create a seamless connection between the interior and exterior spaces. In this image, we can see how the open plan design makes the living area seem very large and spacious. The rooms have been structured so that they flow into one another, creating a beautiful and interactive flow. Natural light dominates the look and feel thanks to the abundance of large glass windows and doors throughout the facade. Not only does this further enhance the interior design, but it makes the room seem that much larger and more spacious. The designers have even added skylights to the roof, which allow sunlight to stream through all hours of the day, without compromising on the family's privacy. This abundance of natural light has allowed the family to opt for darker wooden floors, which create a homely space without making the rooms too dark or dingy. Have a look at these tips for: Bathing your home in natural light. Bathrooms are often areas of the home that get overlooked, but we felt it was worth poking our heads in this one because of its modern and sleek design. As we've mentioned before, you can afford to go for darker tones if you have a lot of light in a space, which is exactly what the designers have done here. The grey tiles on the floor and walls make for a very elegant look and feel, while contrasting beautifully with the contemporary white features including the toilet and basin. You'll also notice that there is plenty of storage space in this room, including behind the mirror and underneath the sink. This keeps all personal products neatly stored away—a must for any modern home! 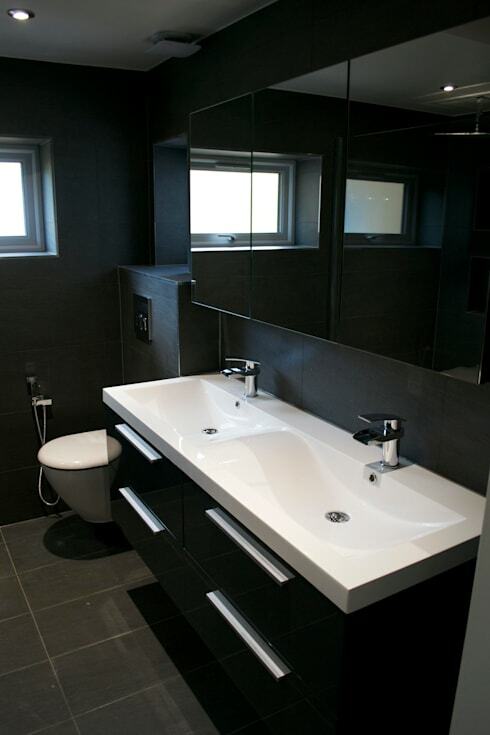 One thing you'll also have noticed in this bathroom is the abundance of mirrors throughout the space. These are very useful for a small room, creating the impression of depth and more space than there is. 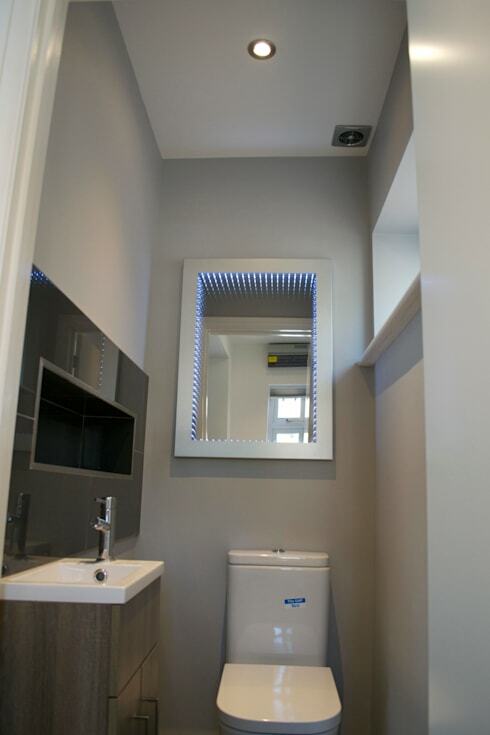 Artificial lighting has also been utilised, enhancing the details and design of the bathroom. Don't you love the lights that illuminate the mirror? When you get ready for work, you'd feel like a rock star looking in this mirror. Have a look at these brilliant, beautiful bathroom trends to see how else you can learn to enhance your bathroom. If you've enjoyed exploring this home, you'll love this: Family home with a big surprise in the backyard. Did you learn anything from this family home refurb?